A football fan with a Tom Brady helmet tattooed across his head is locked up in a Florida jail following his arrest on a narcotics charge. St. Petersburg cops last month busted Victor Thompson, 46, for possession of Spice, the synthetic marijuana. Thompson allowed police to search his pockets after he was spotted trespassing outside a community center. When questioned by police, Thompson said that he purchased the "Master Kush" Spice “from a black male for $15” at a downtown park, according to a police report. Thompson reportedly told cops that he did not know Spice was illegal in Florida, claiming that it was “still legal in New Hampshire,” his home state. Thompson, who said that he moved to Florida three weeks prior to his September 10 arrest, was charged with felony drug possession and trespassing, a misdemeanor. He is being held in the Pinellas County jail in lieu of $1500 bond. 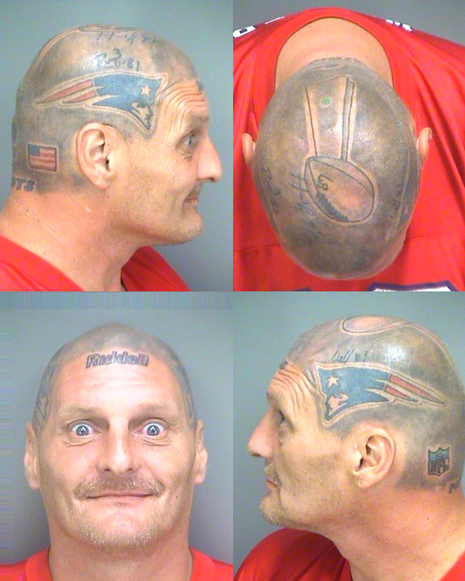 As seen in the above images (click to enlarge), Thompson had a series of tattoos inked on his head to make it appear that he is wearing a New England Patriots football helmet. Along with team logos on each side of his head, Thompson got Brady’s number 12 and the word “Patriots” inked on the back of his head. 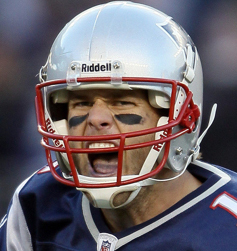 He added the name of the helmet maker (“Riddell”) on his forehead, as well as an American flag and an NFL logo. Thompson even included the small green dot indicating that a helmet is equipped with an electronic device allowing its wearer to receive plays from the sideline. Thompson also had a likeness of the Super Bowl trophy tattooed on the top of his head. Additionally, his noggin features inked replicas of the signatures of players Rob Gronkowski, Wes Welker, and Randy Moss. Somehow, Thompson forgot to add Aaron Hernandez’s John Hancock to his cranium. Jailers took four separate booking photos of Thompson so that his tattoos could be memorialized for possible future identification purposes.